Are you looking for a League of Legends solo queue tier list to win more ranked games and reach Gold, Diamond, or maybe even Challenger the FASTEST way possible? Damage is the name of this patch, and everyone's going for early game kill lanes and other high damage champions all around the Rift. Meanwhile, that might start changing with the advent of the new spellthief top strategy, but we'll see if that actually catches on. For a list of champions with the highest *potential* in the game without regard to difficulty or team synergies, browse the strongest potential champions in each position! Be sure to visit our Optimal Champion Bans by Division too! Jayce [God Tier Top] - In top lane, most match-ups can be determined via counterpick. However, Jayce has few true counters, and does well against both melee and ranged champions alike. Similarly, he can handle both tanks and bruisers. This leaves him available to be picked early on with confidence, and his ability to snowball his lane is immense. Karma [Tier 1 Top] - Karma top might seem like a bit of an odd pick, but the fact of the matter is that most players won't expect to see Karma top (yet). That might change with Huni playing top lane Zilean in LCS, since Karma can do his strategy arguably better for solo queue purposes. I'd expect to see her start rising in popularity this patch unless they nerf the strategy. Karthus [God Tier Jungle] - Karthus has been strong in almost every lane for quite some time now. In the jungle, his early game might need a little map control. However, once he gets past his first clear, Karthus' ability to absolutely annihilate minion camps and enemy champions alike make him incredibly powerful. Meanwhile, the same kill pressure post-6 applies to Jungle Karthus, and his ability to remain hidden while he levels from 5 to 6 means that enemies need to start playing more cautious earlier. Mordekaiser [Tier 1 Top] - When it comes to top lane, players are still sleeping on Mordekaiser top. Since he's far from dragon, most players opt to keep him out of top lane and pull him bot instead. But when it comes to melee match-ups, Mordekaiser is a solo queue extraordinaire. Only Illaoi can compete with him for "wtf-how-did-he-survive" moments. Nocturne [Tier 1 Mid] - Mid lane is seeing a surprising amount of Nocturne lately. His passive heal and waveclear are incredibly good for getting priority in lane, and he does very amazing against melee match-ups. Meanwhile, once he hits level six his all-powerful ultimate gives him incredible map pressure, much like a higher damage Twisted Fate strategy. Sivir [God Tier Marksman] - The new marksmen item changes are supremely beneficial for Sivir as a crit heavy champion. She's also very safe in lane, allowing her to avoid running into bad match-ups and specializes in making bot lane into a farmfest. 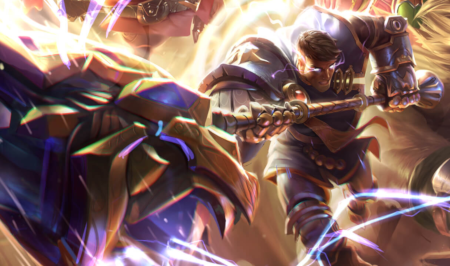 Sylas [Tier 2 Top] - Now that players have gotten additional practice with Sylas and the hotfix is active, Sylas seems balanced when it comes to being a melee bruiser. He's definitely got a niche role in the game, but intelligent use of enemy ultimates can change the flow of a game. Yorick [God Tier Top] - Ever since his buff last patch, Yorick has absolutely dominated top lane. With his ultimate more flexible than ever before, Yorick has become a serious force to be reckoned with. His damage is off the charts and his ability to abuse enemies of all sorts is excellent. Meanwhile, if he falls behind from a jungle gank or two, his late game is still very useful as a permanent lane pusher.